Muru-D SYD3 Demo Night LIVE! I’m here at the Telstra Customer Insights Centre for the Demo Day for Cohort 3 of Telstra’s Muru-D. I’ll be liveblogging the event tonight so keep refreshing the page for updates. 6:24pm We’re all piling in to the theatre. Lots of great people here. Excited to see people like David Thodey, Freddie Jansen van Nieuwenhuizen, Kate McKenzie and Frank Arrigo in the theatre! Ross says 800 companies have applied to Muru-D and about 30 have been successful. He says he’s honoured to represent the alumni. He notes that all the companies who have been through the accelerator program have been through highs and lows. He talks about his firm, Zed Technologies and how upon leaving muru-D he had to deal with competition and redesign the product for different purposes. Ross says he wants investors to continue to invest, mentors to stick with the companies and for families and friends to continue to support. The team asks the audience to imagine your favourite food being delivered. Would you buy from a brand when delivery fails to meet expectations. 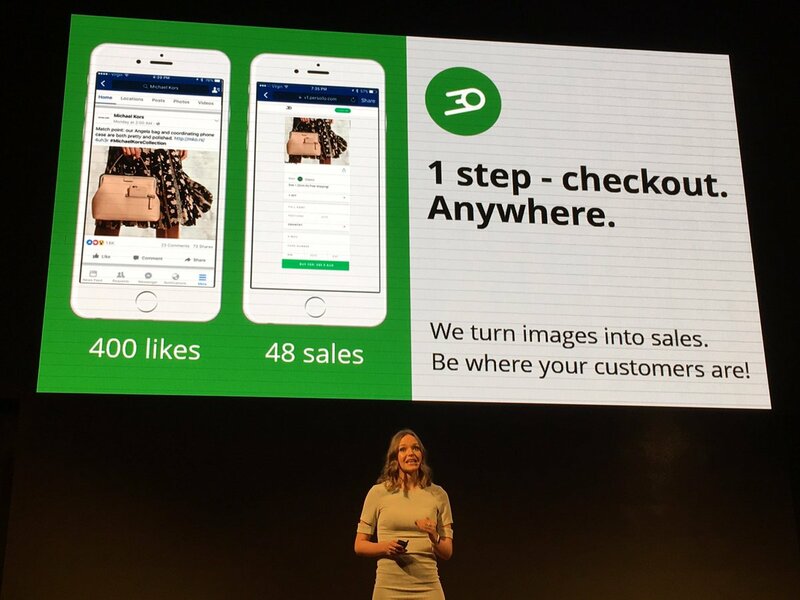 Drive Yello helps busiess build relationships with customers. 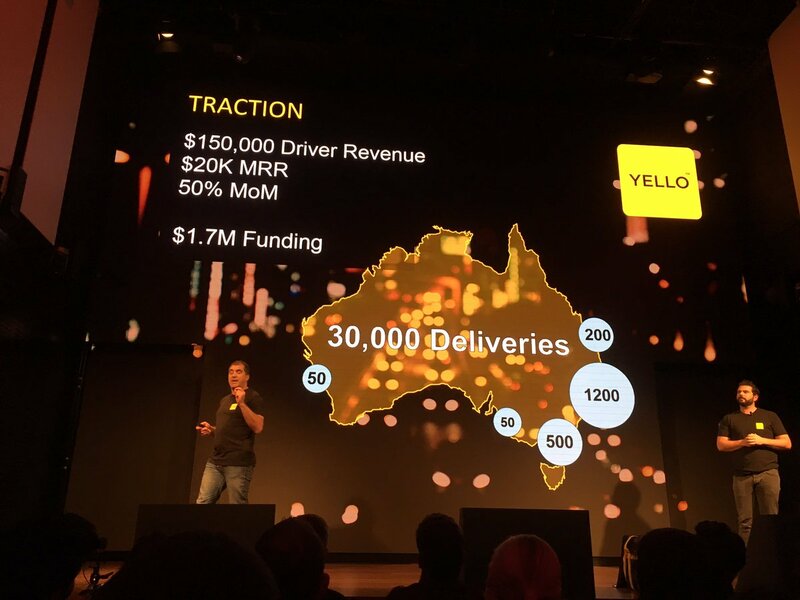 In eight months Drive Yello has delivered 30,000 dinners, and has attracted 8000 drivers. they are ready to scale and have raised $1.7m. Growth potential is huge. Steve has 20 years of experience in tech startups and has exited multiple businesses. His co-founder, Johnny, has huge experience in restaurants, but needed a home delivery option. They note that 50% of the$210 billion food delivery market is in pizza. Drive Yello is focused on that potential. The combination of managing your own staff and doing permanent and long term deliveries is important to restaurants. Drive Yello is doing a series A round shortly. He is looking fir new investors. 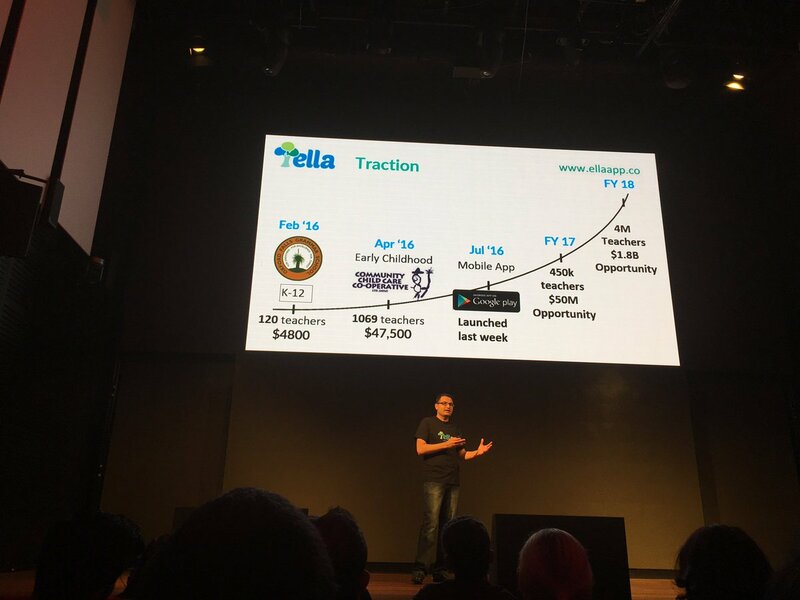 Up next is Atul as co-founder of Ella. Atul talks about his three-year old daughter Sheeba. He notes the learning future is defined by teachers. Teachers are the backbone of the education system. We need teachers. Globally teachers spend $50b on professional development, but most of the skills they learn are from informal learning skills. Professional recognition for the teachers needs to be enabled. Ella has created microcertificates to earn recognition and develop pathways to become a better teacher. He notes that teacher training is a $50b market. Over $300M in Australia. Business model is to make the training available per teacher and then to take a clip on transactions with schools on a per-teacher basis. Currently generating revenue of more than $50,000. Join them in their journey to help create better education for kids. Sean notes he was asked why he is bothering with the web. He notes that if you don’t understand the importance of the web you wont understand the importance of Simpla. Every insight we have is accessible through the web. We are innovating faster than ever before. But the web has issues. So simpla is trying to solve these issues. He notes that one of the biggest problems is Content Management Systems. It’s hard to update information and it doesn’t look the way the user experiences the web. Simpla allows everything on the web to be editable directly. Every website, every app can run on the tech. 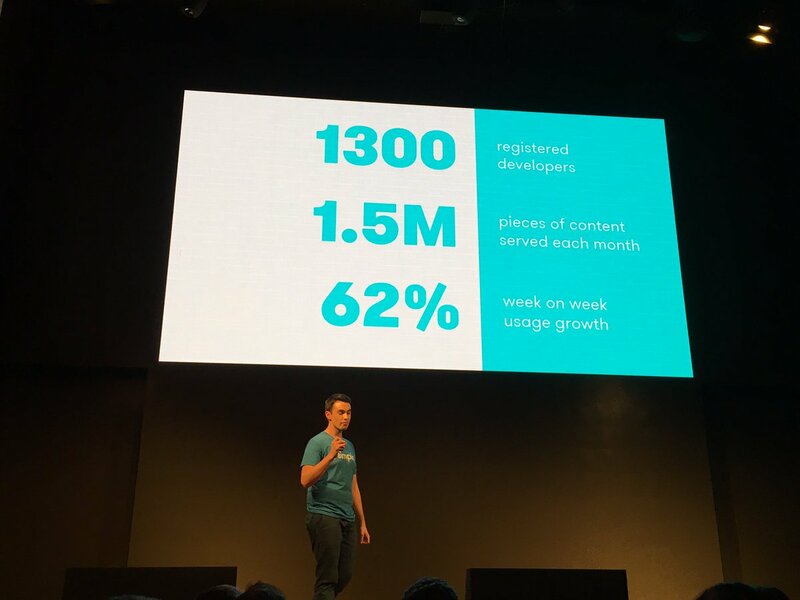 He says Simpla ihas 1300 developers currently registered and it is growing by 62%. He says his customers, including Google Polymer and Human Design love the product and see it as the future of CMS. The company is supported by Seven West Media and they have a huge support base. Olga says salespeople always want to sell more and to sell everywhere. Persollo is the fastest way to shop for fashion on mobile phones. We spend so much time on our mobiles and in social media that this is a natural place to shop. Persollo has created one-step checkout from likes to sales. They have improved sales by 300% for their clients. It’s fast, its brandedm it’s invisible and it is natural. they have generated over $70K in revenue and they have a $2.5 trillion addressable market. Persollo have a global team and they have global customers already. They challenge us to visit persollo.com/i to set up an appointment to help facilitate conversions. Jay says the word ‘therapy’ is going to mean something entirely different in a decade. Right now you sit down with someone. But for someone who is anxious or depressed, it’s hard to go out and get help. In ten years from now, the system will go out to help them through Stepped Care. Stepped Care is a checkup, online treatment, phone coaching and F2F therapy. This is the future of healthcare. Uprise uses Stepped Care to reduce cost of therapy substantially – therapy costs a quarter of traditional treatments. 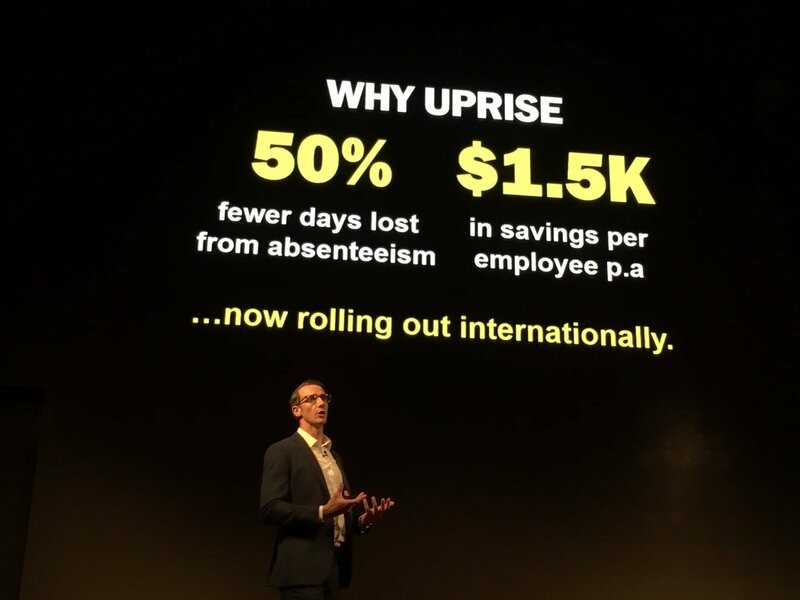 At Lend Lease, 50% fewer days lots from absenteeism. Now rolling out globally with Lend Lease. And they are currently working with a range of businesses to improve the productivity of business. Uprise is building the future of mental health. They challenge investors to help them to help society. They can’t solve all of mental health, but they can make a huge impact on the sector. Technology might be supposed to bring us closer together, but it is often tearing parents apart from their kids. We are all busy, stressed and distracted. But spending up to US$500,000 in raising kids. But most of that is outsourced. Parents need to spend more time with their kids. Our Little Foxes has a goal of creating unbreakable connections between parents and kids. 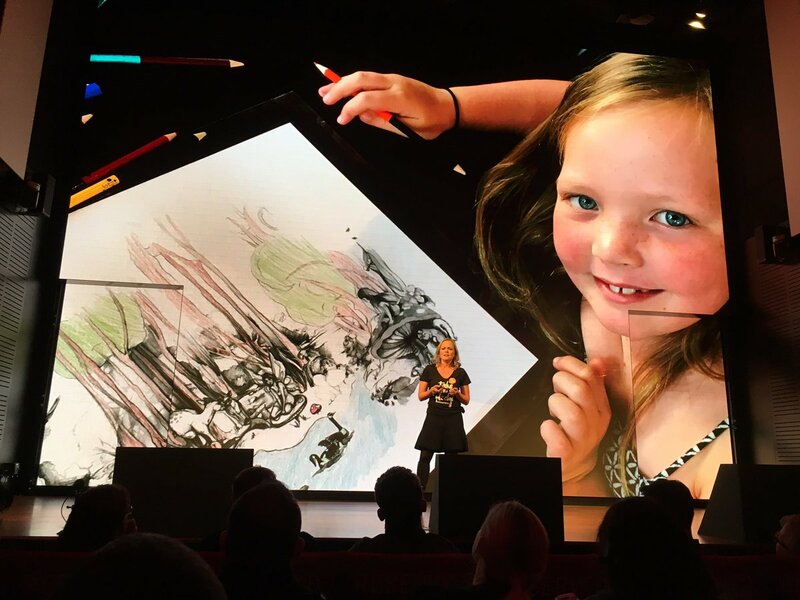 They created kids creativity boxes, ad make $160K on little children. But parents were still not conecting with kids. So they pivoted to a family connections business. They are now offering 3 month projects with parents working with their kids to help build projects together. Their current goal is 200 sales. They want parents to take 7 minutes a day spending time with their kids. They will be rolling out in the US and they want ultimately to grow globally. They have serious traction and the opportunity globally is enormous. Solange says we use tech to do many different things. But in spite of the growth of tech, it is non-digital industries that will see the greatest disruption by tech. We need to start preparing ourselves for the future of wok, For over 20 years, Australia has fewer and fewer students learning STEM. 600% gap in the skills needed and skills generated. Solange says that the way we teach is part of the problem. Quberider inspires learning. NASA, Space X an the International Space Station are partnering with Quberider to create opportunities for students to create and build projects that will go out on a Space X rocket to the international space station and generate data and facilitate learning. Quberider is the first Australian company to get permission to launch something to space. And the first Australian payload to go to the IIS. Quberider got the approval from 16 countries. And it’s come from teenagers, not established scientists. Currently have oversubscribed first launch but want to reach 350 schools in next 12 months in Australia and around the world. Every student deserves to be inspired. This is a team that is on a mission to connect everything. Founder, Luke Taylor notes that once we connect items in our work together we can improve productivity and reduce reliance on resources. Luke says that in their first use case field technicians can reduce their transport costs and time use, by loading monitoring systems into the equipment and assets being supported by service technicians. They started with swimming pool technicians. 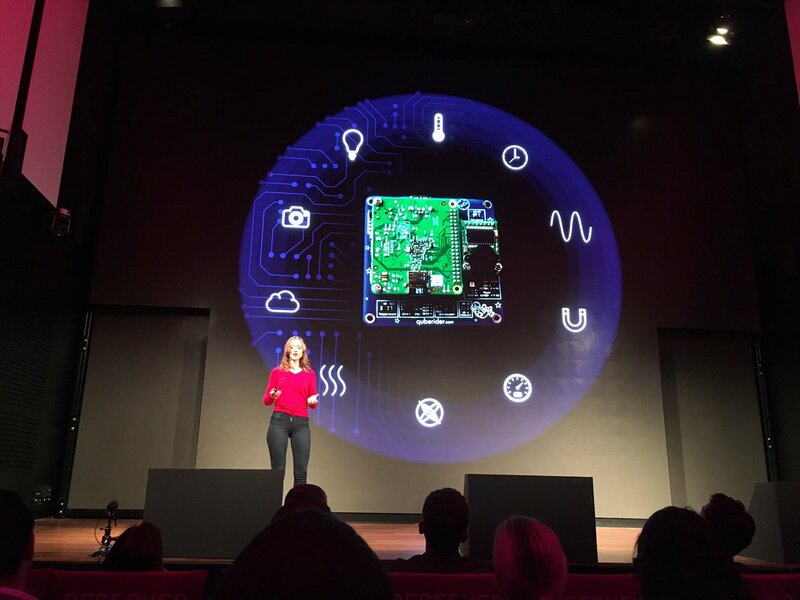 SkyGrid notes the opportunity for IoT is $16trillion. 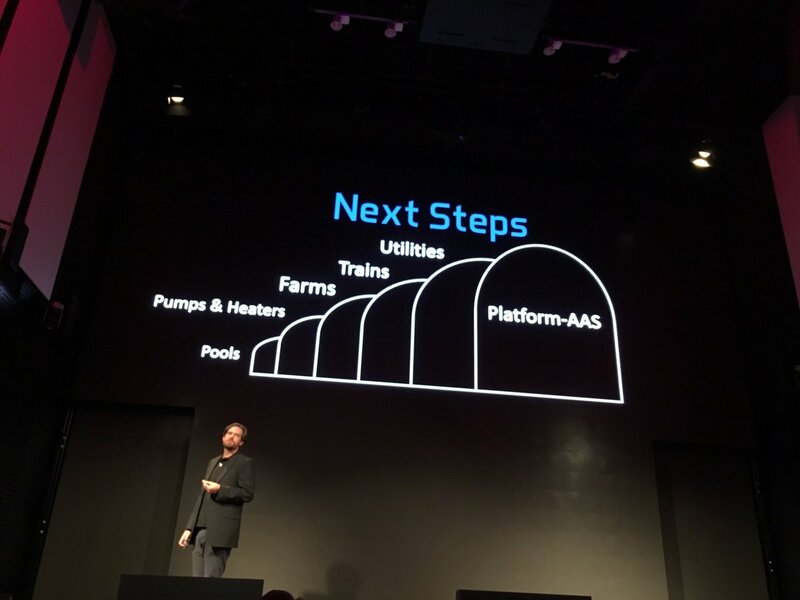 They are moving in to hot water systems and agriculture as well as other service industries.They want to help Aussie manufacturers to improve efficiencies of operation for all kit. Luke challenges the investors to help improve how business operates by enabling remote monitoring by connecting everything. Be part of the future of manufacturing. Nasir starts by noting that 2 years ago he was on a ship in the middle of the Atlantic. It was 2am and he was putting a drone into the water. He was on an exploration vessel. Four hours after putting the unit in the water, they hit the bottom of the ocean. He saw a football field sized oasis of life. Nasir notes that we have not begun to explore the vast majority of the world. This is why he established Abyss. Their autonomous drones navigate around deep water objects and provide information and imagery. 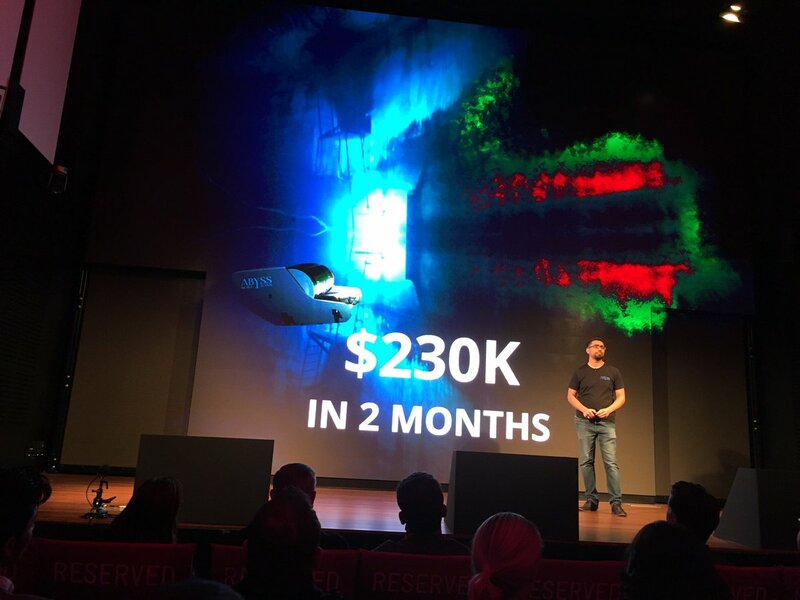 Have already generated $230K in revenue and have over $2m of revenue in the pipeline. Their addressable market starts at $5.7 bn for shallow water activities, and then moves to ships and remote drilling platforms as well as deep ocean exploration projects. The team is highly experienced, and they are growing. There is so much out there that we haven’t discovered. Abyss is covering the blue part of the globe. Mick acknowledges the work of mentors and investors in changing the shape of businesses. And a number of mentors have come together to create a new investment fund. Andrew Coppin mounts the stage to talk about this fund, Bardama. Coppo talks about the theory behind Bardama. 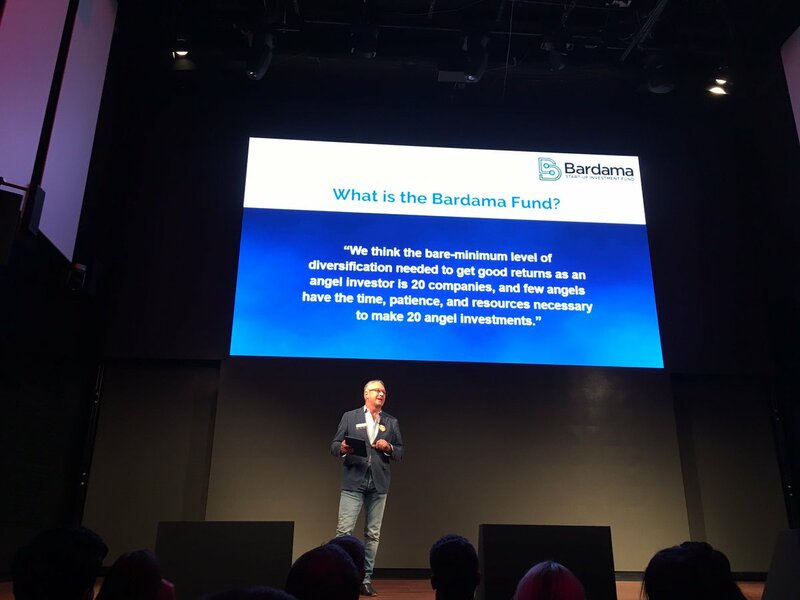 He notes that if you are not sure about ho to invest in these companies, Bardama may be your opportunity. It is a portfolio approach to investing in Australian Tech Companies. Rather than investing in one or two companies, it allows investors to take a stake in all of the muru-D companies. As an angel investor, to get good returns you need a stake in about 20 companies. The Advisory Board has immense collective experience and they want a collegiate approach to investing. Coppo notes they follow companies while in the program and they follow those after they leave the program. The fund has reached the minimum and is now open to new applications. It’s for sophisticated investors, costs $25K per annum for three years. You can find out more at bardama.com.au. Mick gets back to the stage. He notes he’s about to move to Silicon Valley with his family. He will be working with the portfolio companies from the US. He notes that muru-D has found a new entrepreneur in residence in Ben Sand. Mick thanks Telstra for their continuing support. Muru-D are building great teams, businesses and entrepreneurs. He thanks muru-D founders, Annie Parker and Charlotte Yarkoni for their support. He notes that everything he has learned has been in collaboration with people in the audience. Annie Parker mounts the stage. She notes what a pleasure it is to witness the achievements of the teams. 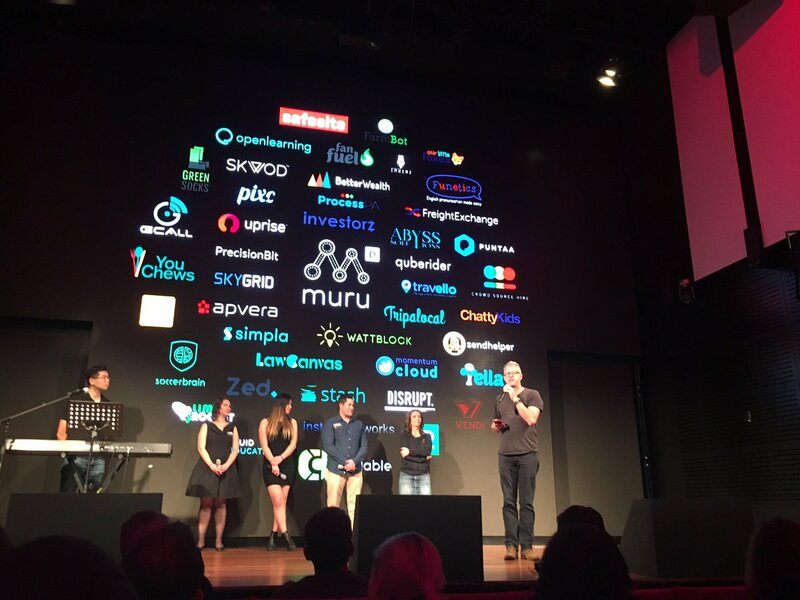 Annie notes that muru-D has a number of partners globally, as well as muru-D in Singapore as well as partnerships in Brisbane at River City Labs. FarmBot – rose from a difficuklt period and have now a large pipeline of customers with perfected tech. Annie thanks SevenWest Media for their support and investment in Muru-D. She thanks David Koch for supporting the doco that will be released later this year. She also thank Tyson Hackwood from Braintree. Finally she thanks all those watching online and the muru-D alumni get ready on stage as a musical item is prepared. The muru-D choir dedicate their thanks to Mick. Phil Morle mounts the stage to wish Mick the very best. Annie thanks Charlotte and Mick with t-shirts for the brains the soul and heart of muru-D.
We are closing up for the night. Thanks for reading. And thanks to Dale Cohen for his images all night. 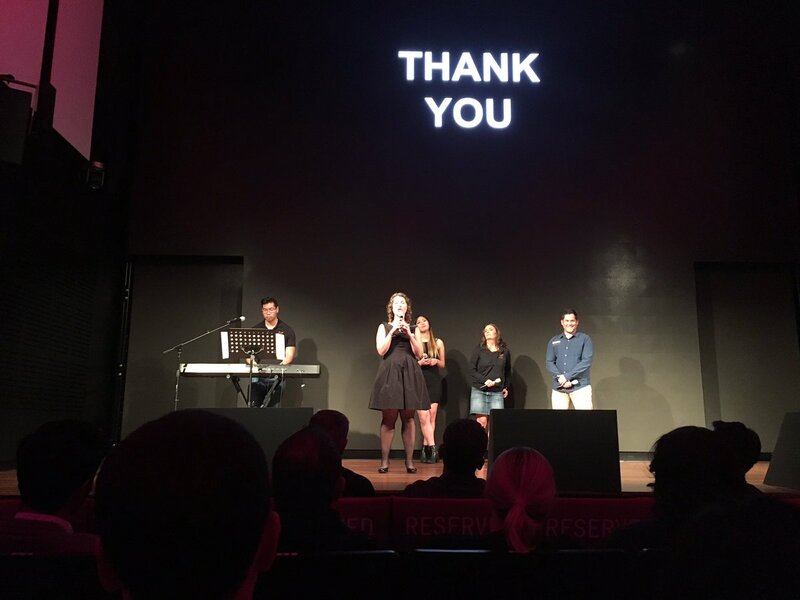 This entry was posted in blog, events and tagged #SYD3demo, muru-d, startups, sydney. Bookmark the permalink.